I shared this myth a couple of years ago on Valentine's Day and people seemed to dig it, so I will tell it again this Valentine's Day, but a bit differently, as I have different thoughts about it this time around. Myth's tend to evolve with the reader; the story may mean different things at different times and different things to different people. Jungian analysts and Depth Psychologists love to use myths tools in psychoanalysis. Joseph Campbell is also famous for his work with myths and specifically the hero's journey. 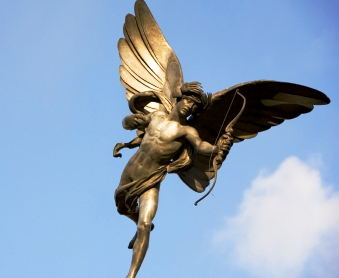 The following is a myth about Eros, otherwise known as Cupid. The story begins with Eros' mom, Aphrodite, the Goddess of Love. Although Aphrodite was an extremely beautiful God, she grew increasingly jealous of a pretty young mortal, Psyche. One day, Aphrodite couldn't cope with her feelings any longer andin a fit of rage ordered her son Eros to fire one of his arrows into Psyche's heart, cursing Psyche to fall in love with the ugliest man on earth. Eros flew down to Earth to find the mortal Psyche. He fully intended to follow his mother's orders, but despite his intentions, he fell in love with Psyche. He captured her and took Psyche with him. They both fell in love and enjoyed a great and powerful connection... with one rather large caveat; their love existed only in the dark. Their room was kept in darkness at all times. Eros instructed Psyche to keep all light away from him and she was absolutely forbidden from shining any light directly on him. One day Psyche's sisters came to visit her. They felt jealous of Psyche's blissful happiness and began questioning her about Eros. "Who is this man whom you say that you love, but you've never really seen?". After her sisters departed, Psyche felt depressed and shortly afterward, she became convinced that she needed to see Eros in the light! One night, while Eros was sleeping, Psyche lit a lamp and allowed the light to shine directly on Eros while he slept. She was amazed to see his beauty and to find that he was not a mortal, but a God! Then Psyche accidentally spilled the lamp oil onto Eros. He awoke in a fit of terror and rage; he then vanished from Psyche's life. Psyche was heartbroken and began roaming the earth, looking for Eros. She felt lost and ungrounded. Soon she learned of three tasks she could complete in order to reunite with Eros. One of which was a trip to the dreaded underworld. Through a reconnection with herself, nature and trusting her experience, she completed all three tasks and was reunited with Eros. Myths have a unique ability to access a deeper knowing that exists in all of us. Many Jungian and depth oriented psychologists utilize myth to access the collective unconscious and archetypal energies which exist theoretically in all of us. (The collective unconscious is different from and in addition to the personal unconscious in that it is a stratum of reality that "does not derive from personal experience and is not a personal acquisition but is inborn...universal...[and] more or less the same everywhere and in all individuals." (Jung, 1934 ). Eros and Psyche's story and struggles are truly timeless; it's in our DNA. Do we dare to shine a light on ourselves, our relationship, the truth? Can we trust our own experience? One might say Psyche's love with Eros was only in her mind prior to seeing his true form. She was relating only to her idea of Eros; her relationship with the actual Eros was "in the dark". In choosing to shine the light, she is choosing to risk the relationship she currently knows, in service of seeing the truth of who and what Eros is...true knowing, "intimacy". We might argue that this questioning, psyche's separation from and then reconnection with Eros is a natural evolution of relationship. Perhaps we are always shining a bit of light (on self and partner) for a teeny bit more truth, running away from that, then working to tolerate & integrate, and once again reconnecting (theoretically at a higher level). Happy Interpreting and Happy Valentine's Day. More on Myth: Check out Joseph Campbell's "The Power of Myth"